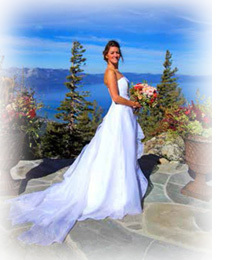 One of the best places in Lake Tahoe for a summer wedding where the view is one of unimaginable beauty is the exotic Blue Sky Terrace on top of world-class Heavenly Mountain. This very unique and pristine location has sights that are unparalleled to any other in the Sierras when it comes to walking down the aisle on a very special day. Your extraordinary journey will begin at the Heavenly Mountain Resort gondola base located in Heavenly Village near the state line of California that borders Nevada. 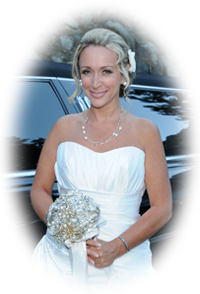 Here you’ll hop aboard a 6 passenger gondola cabin that will whisk you up Heavenly Mountain to a dazzling destination for your once in a lifetime conjugal event. You’ll traverse upward alongside the attention-grabbing Sierra Nevada Mountains, a voyage that will reveal striking aerial views of Lake Tahoe and the surrounding areas, views so extreme that they almost seem surreal. The trip to the midway station and observation platform where the adjacent promenade is located lasts about 15 minutes, covering a distance of approximately 2 ½ miles. Upon arrival, you and your guests will disembark from the gondola at the observation area and enjoy additional panoramic beauty at an altitude of 9,123 feet. Once you step foot onto the veranda you’ll feel like you’re on top of the world. The serenity of your private setting with unspoiled views combined with the additional amenities provided will certainly impress you and all of your guests. 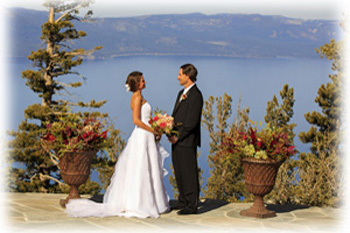 Without question, this spectacular site with an inconceivable backdrop is one of the finest in Lake Tahoe. 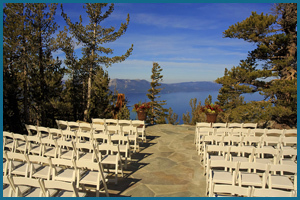 The ceremony terrace on Heavenly Mountain is suited for formal, semi-formal, or casual attire. 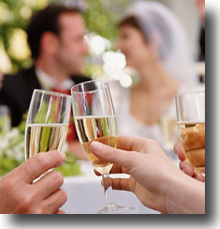 Up to 150 guests can be comfortably accommodated. There is only one reservation time available each day on the terrace. Keep in mind that although the price quoted is based on a minimum of 50 people, fewer people may attend. However, the quoted price does remain the same. On a budget? 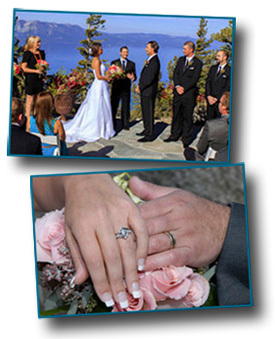 Save $2,500 on your mountaintop wedding!